Adsense placement is the gentle art ensuring that Adsense ads appear in the correct places on a website or hubpage. What do I mean correct – well I mean the right place for the ads to have the best chance for the visitor to click on them. Lets face it if you are running Adsense ads you are doing it to make money – not because you think they are beautiful or anything. So if you are going to use Adsense you might as well give yourself the biggest possible chance for a click – don’t you think? There is little guess work involved in this – in fact there is quite a lot of information available on the best Adsense placement – some of it from Google itself. On HubPages you don’t have the total control of where the ads appear – HubPages uses their own proprietary technology called “yield build” which does a good job ensuring that Adsense placement is optimized on hubpages. YieldBuild makes it easy for people who don’t want to deal with the technicalities of using html and doing their own testing. 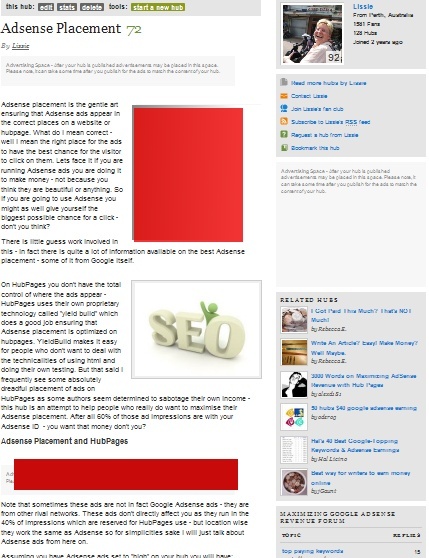 But that said I frequently see some absolutely dreadful placement of ads on HubPages as some authors seem determined to sabotage their own income – this hub is an attempt to help people who really do want to maximise their Adsense placement. After all 60% of those ad impressions are with your Adsense ID – you want that money don’t you? Note that sometimes these ads are not in fact Google Adsense ads – they are from other rival networks. These ads don’t directly affect you as they run in the 40% of impressions which are reserved for HubPages use – but location wise they work the same as Adsense so for simplicities sake I will just talk about Adsense ads from here on. here is a block of ads right at the very bottom of the hub. These three blocks appear to have a fixed location – I don’t know of anyway to get them to move around – if you do please leave a comment below but I am pretty confident that these blocks are the default ad placement for Adsense on Hubpages. and a narrow horizontal strip of ads which runs through the middle of the hub. These are the two adsense blocks that hubbers manage to muck up all the time. The golden rules here is very simple: having more ads above the fold is better. The “fold” is basically the lowest point on the initial screen that a reader can see before they have to scroll to read further on. It obviously varies depending on the size of you monitor- my monitor is a 14″ so I know if an ad shows above the fold for me – it will show for 99% of the Internet! You will see a large rectangular block at the top right – I would personally prefer it to float left – but I don’t have that option here so right is second best as far as I am concerned. Either way it creates a L-shape with the ads across the top of the hub. The next optional ad block is the horizontal block which is showing just below the subtitle “Adsense Placement and HubPages”. Below the title seems to have two purposes – one it makes sure that the ads will focused on the words in the title (which are tagged with H2 tags for the html literate). But for some reason readers tend to click on ads below a title more than they do anywhere else except for the big rectangle near the top. To get an Adsense block to show in this position you need to do two things – you need to have at least two text capsules – three text capsules if you have a photo as well. The second thing you need to do to ensure this ad placement is to put the title at the bottom of the text capsule above – NOT in the title of the text capsule below. You will get an identical sub-title whether you use the title of a text capsule or if you tag a line as header 2 in a text capsule. In both cases the line will be tagged as an H2 title and will look like a sub-heading to a reader. Finally if you want to optimize a hub for Adsense – you need to focus JUST on Adsense – you don’t want a pretty picture, you don’t want Amazon or eBay capsules. You may however want to add a relevant news feed because it gives you an excuse to use your keywords in a title again – and it will automatically update the hub and keep it “fresh” for Google. But here’s the trick – you need to write enough – maybe 600 words – maybe 800 – more words give you more odd keywords that people will find your hub with. And no you don’t need to stuff keywords in deliberately. Have about 5 or 6 related keywords – add them as tags – let the auto suggestion tool ad some more – after all the computer is parsing your words to find what it thinks are relevant phrases – just the same way that Google will. Also you need to write good enough – but not too good – this hub has useful information – but most of the good stuff is near the bottom of the hub. If you are still reading now you are not going to click an ad – so I might as well tall you something useful, but upfront – no there is nothing terribly interesting – just words on a screen that require some effort for the visitor to read. Oh and this hub has come up to 1000 words – I could have said the same thing in 300 words – but that wouldn’t be so good for Adsense.